Today I take you to a different kind of topic that less fashion focus, but more of a lifestyle post. 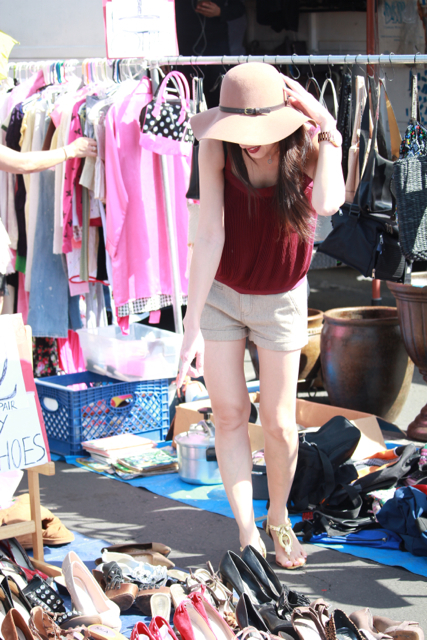 If anyone asks me what I like to do on the weekends, going to the flea market is absolutely on top of my list. What’s not to love when I can get my exercise for the day, picking out fresh produce, unique products, and plants from local farmers. It’s also fun to see families with little kids strolling around treasure hunting and eating their street snacks, the kind that you can only find at the outdoor market. There are two places in my neighborhood, one is at Orange Coast College and the other is Golden West College. This is my favorite place as there’re more vendors. For my local readers, if you pass by Huntington Beach area, I strongly recommend Golden West College location. For other areas, I would put flea market then your city into the search engine to find out the locations for that particular city. Have I also mentioned that it’s also my best destination for my kitchen supplies? As these gas burner liners sold for $1/pack. Shoes are like candies to me, in case you have not noticed. As always, thanks so much for reading and wish you a great rest of the weekend!